Courtesy of New Albany Realty, LTD 614-939-8900, Jean M Lesnick 614-939-8937. Private Country Estate with enough open land for an equestrian paradise. 148 acres of woods, pond, fields, wild flowers, & heated in-ground 30′ X 60′ pool w fireplace & terrace. Created for a comfortable & relaxed lifestyle. Spectacular views from all rooms plus a walk-out lower level with 4 zoned in-floor radiant heat. Floors on the main level are cherry with maple inlay, floor to ceiling stone fireplace in liv. room along with wood beamed cathedral ceilings. (4 interior,2 ext. fireplaces). Whole house generator, Gutterless French drain system, Synthetic Slate 50yr roof. Crestron sound system in house, Screen porch & decks. Custom cabinets & closets. Irrigation system, 6 acre stocked pond, Private Water well. District: GRANVILLE EVSD 4501 LIC CO. Please, send me more information on this property: MLS# 214046805 – $3,900,000 – 2751 Silver Street, Granville, OH 43023. 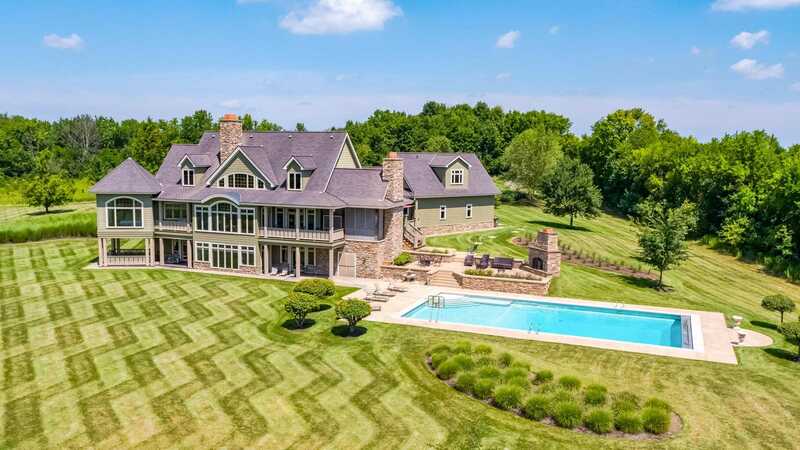 I would like to schedule a private showing for this property: MLS# 214046805 – $3,900,000 – 2751 Silver Street, Granville, OH 43023.